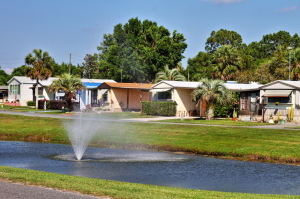 There are lots of manufactured homes for sale in and around Leesburg, Florida, but only Lake Griffin Harbor offers affordable homes in a resort-like setting, combining to give you the retirement lifestyle you want on a budget you can afford. We have 350 lots filled with attractive, well-constructed manufactured homes that feature updated appliances, vinyl windows and siding for easy maintenance, and central air conditioning and heating. These are homes that you can be proud to call your own, and they’re priced to be attainable on most any retirement budget. But you won’t be spending much time indoors when you retire to our Leesburg, FL, community. Lake Griffin Harbor offers an amazing assortment of amenities and activities – from a heated pool for swimming laps, to shuffleboard and horseshoe courts for some friendly competition, to a spacious clubhouse on the banks of Lake Griffin for fun social activities like dances, potlucks, and games. And at night you can head to the clubhouse observation deck to watch the sunset over the water, a picture-perfect way to end an invigorating day of activity. Plus, Lake Griffin offers wonderful opportunities for fishing and other aquatic activities. In fact, the bass fishing is so plentiful on Lake Griffin that it often is used to host professional tournaments with anglers competing from around the world. And to think, once you take up residency here, you can have access to this wonderful resource any time you’d like. Contact one of our friendly Lifestyle Consultants today to learn more about Lake Griffin Harbor in Leesburg, FL, and our manufactured homes for sale. At Lake Griffin Harbor, you’re not just buying a home – you’re embracing a lifestyle.